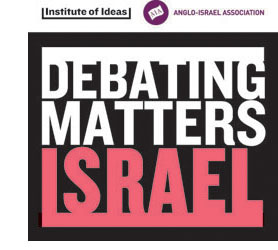 The Academy of Ideas Debating Matters Competition is delighted to be working in partnership with G4S, on ‘Debating Matters Beyond Bars’. The prison teams will be supported by Debating Matters with on-site debate training days, giving an overview not just of the competition format but also of the importance of debate more broadly. The prison debaters will also receive a series of specially updated Topic Guides, the competition’s acclaimed resources, which set the contemporary scene in which the topical issues they will discuss are taking place. Each debate will be judged, as always, by a panel of three invited guests, from all walks of life and professional backgrounds, who will cross-examine the prisoners on what they’re arguing. 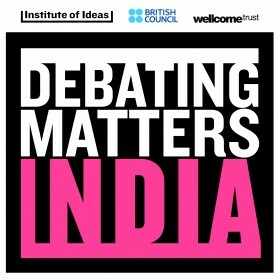 The Debating Matters Beyond Bars 2017 debates will be held over two separate days in August and September 2017, and culminate in a grand finale between the two teams who win through to the final debate. As part of the final day, a ‘Question Time’-style debate will be staged, chaired by director of the Academy of Ideas, Claire Fox, with a panel of special guests, and an audience of prisoners, family members, HMP Birmingham staff and guests. In partnership with Freiblickinstitut e.V. 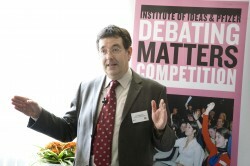 the Academy of Ideas Debating Matters Competition has been staged in Berlin since 2015. In 2017, Debating Matters Berlin was hosted by venue partner the University of Applied Sciences Europe (formerly BiTS Hochschule), and eight schools from across the city fiercely competed for the title of ‘Champions 2017’. Eventually, the Nelson Mandela School debated their way to victory over their impressive opponents. The competition returns on 28 February 2018 in the fight to find the 2018 Champions, with 12 schools taking part. View the programme and the new topic guides here. Thanks to our partners for DM Berlin Freiblickinstitut e.V. for their support on this project. 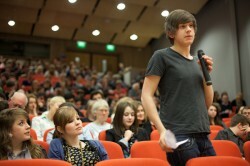 The Debating Matters Changing Age event, in partnership with Newcastle University, took place on Thursday 29 April 2010 at the King’s Road Centre, Newcastle University. The day saw eight schools from across the North East will come together to consider the medical, moral and social issues facing society’s ageing population. Newcastle University’s ‘Changing Age’ programme is a year-long series of events and activities organised by the university, which houses the prestigious Institute for Ageing & Health (IAH). The IAH brings together clinical, social and computer scientists, engineers, and researchers in a variety of other fields, to address the increasingly important issues of how and why we age, the treatment of associated disease and disability, and the support of through-life health, well-being and independence. As well as the programme celebrating Newcastle University’s achievements in ageing-related research over the past 40 years, it will also be a platform for contemporary debate and discussion on age related issues. As well as a series of Debating Matters debates, the day began with a fantastic ‘In Conversation’ lecture, given by Professor Tom Kirkwood, Director of the Institute of Ageing & Health, who celebrated the fact that we are all living longer than ever before, in much better health, and considered what the future of ageing might look like; and a ‘Question Time’ style panel of eminent commentators and scientists where students can continue to explore the ideas and issues with a distinguished guest panel. In a series of Debating Matters debates, students from across the North East considered the issues around older mums and radically extending the human lifespan. The day started with a fascinating opening speech from Prof Tom Kirkwood of the Institute for Ageing and Health who celebrated the fact that we are all living longer than ever before, in much better health, and considered what the future of ageing might look like. Prof Kirkwood was then engaged in an exchange of ideas with Dr Iain Brassington, bioethicist at the University of Manchester and Dr Kevin Yuill, a historian from the University of Sunderland, as well as some pertinent questions from the student audience. The day finished with a ‘Question Time’ style panel of eminent speakers including Dr Jack Watters from Pfizer; Anne Johnstone of The Herald; Prof Jim Edwardson of the IAH; and Sean O’Connor, co-adapter of the acclaimed ‘Juliet & Her Romeo’ at the Bristol Old Vic, who fielded a range of questions on ageing from the young and engaged audience. We would like to thank Newcastle University for their partnership in this project, and for helping us create a unique event for schools in the North East. 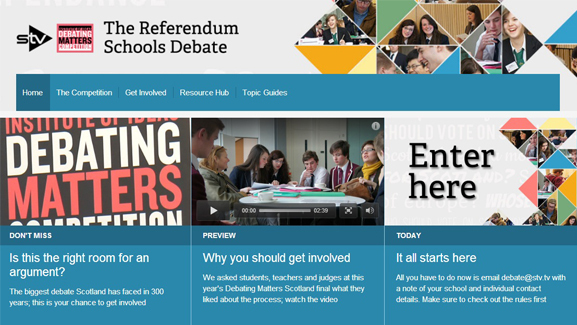 Debating Matters UK debates debates debates. In the UK.